Fluxion E&M is the work of Mr. Young Ahn, a Korean-born electrical engineer, who lives and works nearby me, in the rural farmlands outside Brantford, Ontario (Canada). Out here, ginseng has gradually replaced tobacco as the main crop, but it seems transistors have yet to replace vacuum tubes. Hallelujah. Mr. Ahn has been building and selling his amps for a while now, but I believe this is the first ‘industry review’. A more interesting gentleman you will rarely meet in this hobby. 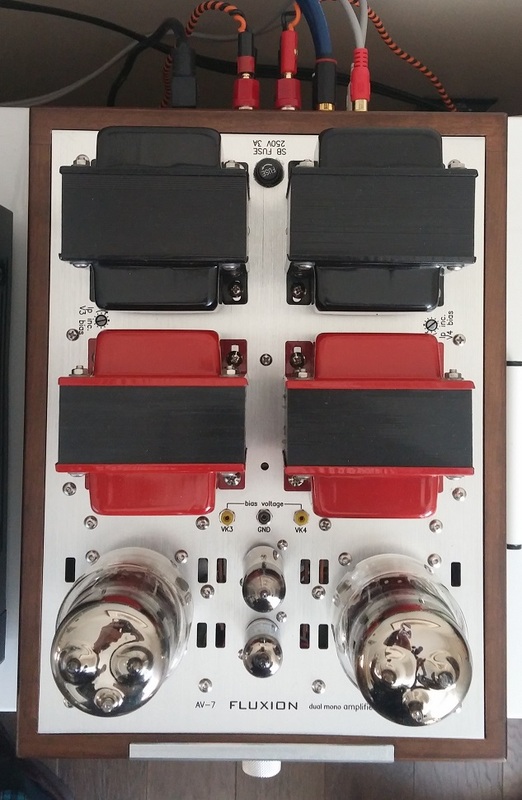 And I should clarify: not only does Mr. Ahn hand-build each amplifier, he also designs all his circuits, and even winds all his own transformers. Yes, all the power and output transformers are all wound in house on a winding machine, and Mr. Ahn says this allows him to pass on a savings to the buyer. The number of companies doing this nowadays can probably be counted on one hand. 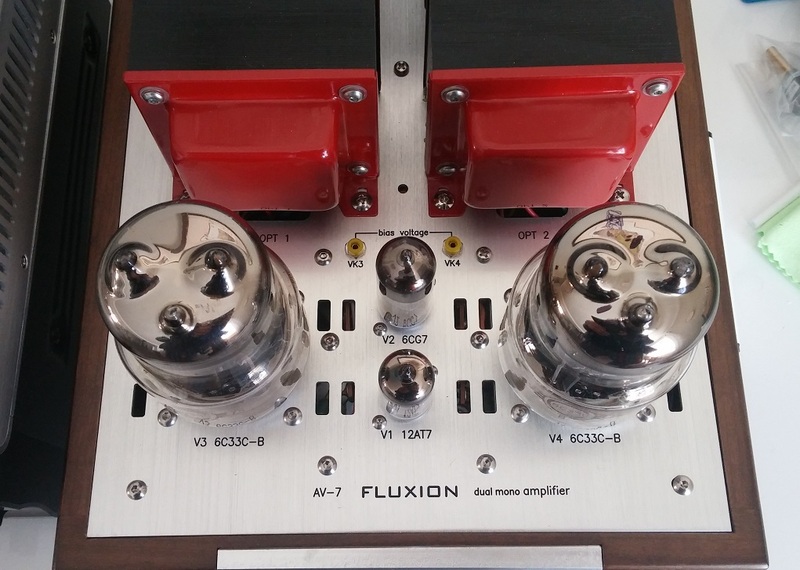 Fluxion amps are given their model designations in homage to notable contributors in the field of electronics. The AV-7 is named after Alessandro Volta, who invented the electric battery. This is a 12-watts-per-channel, single-ended design, using the Russian 6C33C-B power tube. This is the infamous triode tube that was unknown to westerners until a MiG25 fighter jet was landed in Japan by a defector pilot, and dismantled. I won’t try to relate the history, it’s all readily available to look up if you’re interested. 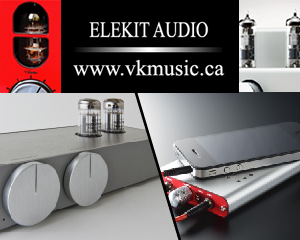 The tube does possess excellent audio characteristics, and is now used in numerous commercial and DIY amplifiers. While the 6C33C can be used in OTL configuration, Fluxion’s AV-7 is a traditional transformer-based amp. This amp is a true integrated design – it has three gain stages (achieved with only four tubes), and two switchable line-level inputs. The two initial stages employ a single dual-triode each, so retubing should be fairly economical. In any case, no additional preamp is needed here, and I didn’t use one in any of my listening (apart from phono, which I fed in via the Cambridge CP-2). The amp uses fixed bias, in other words, the bias is adjusted by the user. Points for your voltage meter are included on the top of the chassis. It’s a true dual mono design, there are two power transformers and two chokes. A modest amount of negative feedback is used (3dB). The input sensitivity is listed at 270mV and the output is 8 Ohms. The overall build quality is very good – far better than you’d expect at this price level. Mr. Ahn designs his chassis plates with CAD software, and has them made in South Korea. The wood bases are made locally, and they look excellent too. I utilized the AV-7 with my Lowther EX3’s (Tercel cabinets), and Pro-ject RPM3 turntable. This amp is very quiet, having no audible hum and almost no self-noise. And sonically – wow, it delivers a very dynamic performance – it sounds like it has loads of power, for a single-ended tube amplifier. It sounds more like a 50-watt amp than 12! Yes, my speakers are very sensitive. 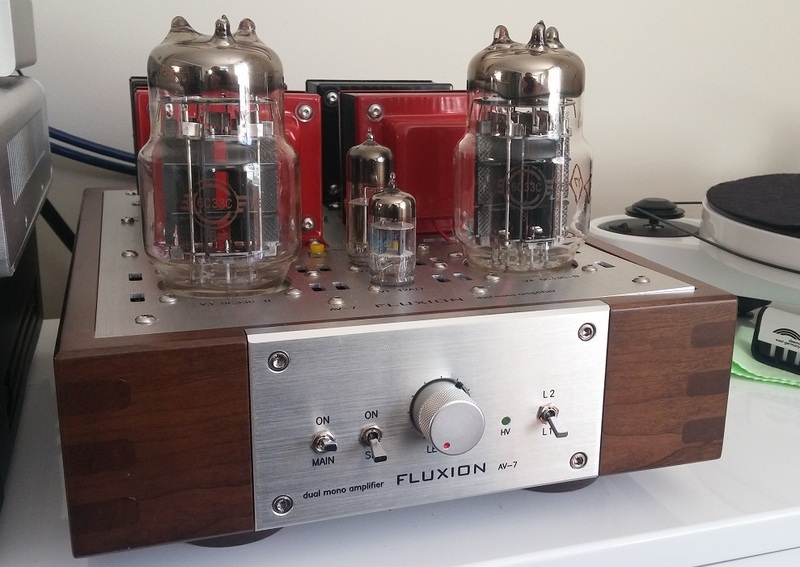 But comparing the Fluxion with other amps, more and less powerful, it really has a lot of oomph. Hearing it with the Paradigm speakers in Mr. Ahn’s lab suggested to me that this amp will drive speakers of moderate sensitivity quite well. On Schubert’s Sonata for Piano and Arpeggione (Decca SXL6426, LP), the piano and cello tone were very good, and overall sound was spacious and detailed. This is one of my “reference” discs, in that I know it well. If you like chamber music, check it out. 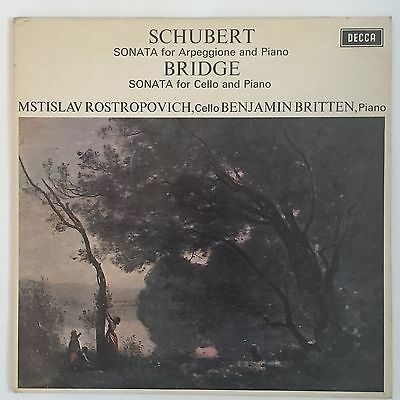 The performances by Britten and Rostropovich are first rate, and the recording is lovely. On Side 1 (Schubert), the fortissimos this piece is famous for are delivered with passion, and a good sense of power. The decay on notes and chords was excellent. I noticed that the piano and cello didn’t try to “dominate” each other – in other words, I couldn’t hear an audible frequency imbalance that favours one over the other, as I sometimes do on this record. After thinking, gee, this is some high-end analog sound, it dawned on me that all this was with the lowly Ortofon OMB10, my cheap backup cartridge! Not bad at all. 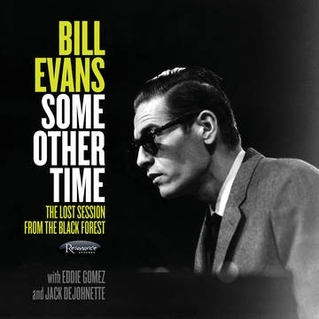 I listened to the Bill Evans CD Some Other Time: The Lost Session From The Black Forest, this is a fantastic two-CD package featuring Eddie Gomez on bass and Jack deJohnette on drums. I was mesmerized by this performance, and sonically it was both meaty and not lacking in subtlety (that’s what my notes say!). I think there’s a theme developing here. The soundtrack to I Am Sam is made up of Beatles covers, with all the performances arranged and recorded in a whirlwind 3-week period. There are some really nice tracks here. I noted that the vocal layering on Two Of Us was especially clear – Michael Penn and Aimee Mann harmonizing, sounding better than I’d heard it before. This is not a particularly great recording, it’s just a good OST CD. 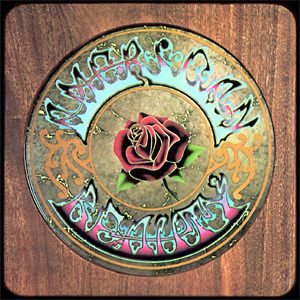 Next up I played some American Beauty, the Grateful Dead’s 1970 classic. This is the only Dead record I really like from start to finish…I never saw them live and I’m not a fanatic. Ripple is a great track for hearing vocal ranges and harmonies, and with the AV-7 in my system, all the subtlety of the harmony build up is there, in spades. Wonderful, lucid midrange. The sound on this LP seemed slightly bass-shy, but this could have been my speakers, or certainly, the budget MM I was using. 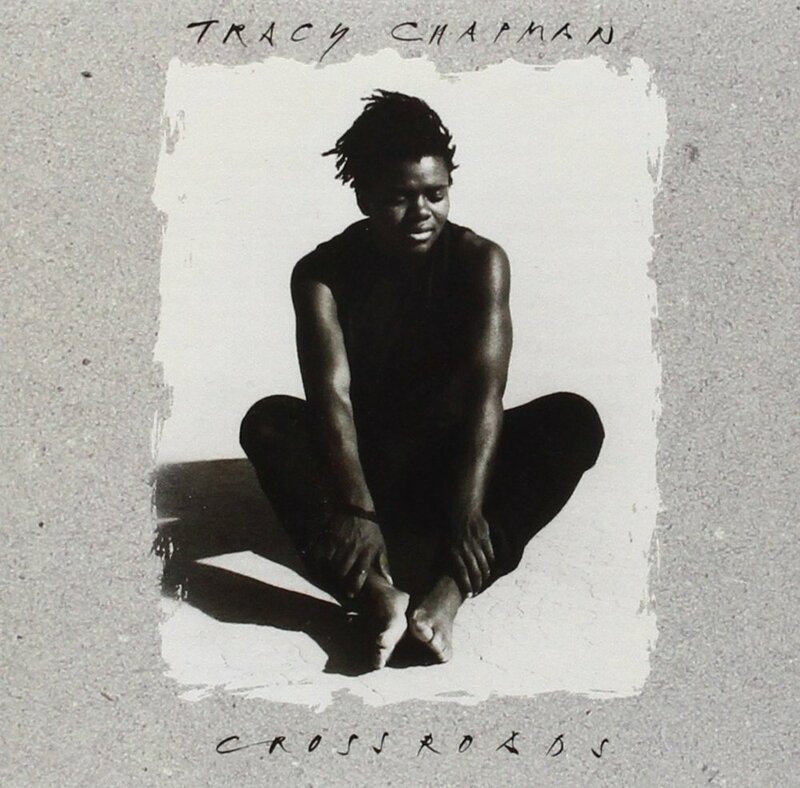 Another favourite I spun was Tracy Chapman’s Crossroads, her outstanding 1989 sophomore effort. Again, the mids and highs were beatifully solid, while the bottom end (noticeable on tracks like Crossroads and Freedom Now) was a little weaker than it is with my Pass solid state amp. It wasn’t a glaring fault, just a note. In fairness, the Pass has more solid bass than any tube amp I’ve used. A nice design touch is the two-stage power up. Switch the mains on, and wait a minute or so for the filaments to warm up, then use the adjacent switch to turn the amp from Standby to On. This also allows you to put the amp back on Standby, keeping it ready for action, say, if you have to step out for an hour or two. Warm? The amp warms up after 5-10 minutes, and yes, it does run very warm. Hot, even. The 6C33C’s, the chassis top plate, and the power transformers all become hot to the touch after about 30-40 minutes of play time. However, this is by design, and the tubes are all operating well within their safe limits (the 6C33C was originally a voltage regulator, and some have called it the strongest triode ever made). Mr. Ahn also thoroughly stress tests each of his amps when he completes them. And with respect to testing, it should be noted: Mr. Ahn is a firm believer in measurements. His lab is full of test equipment, and he places a higher emphasis on getting solid measurable results, and prefers to leave the listening comments to the end user. This is part and parcel of his EE background. This amp is somewhat of a bargain at only $1249 Canadian. And I say “somewhat”, only because the Fluxion name is not well known yet. If it were, I think its price, and corresponding resale value, might be much higher. Mr. Ahn backs up his products with a 2-year warranty (not the tubes, of course). Consider also that you’re getting a custom-designed and handmade finished product of high quality, and the price does seem very good. Also, the amp is delivered with relatively ‘basic’ parts – the tubes and capacitors aren’t fancy or pricey, though the miniature tubes supplied are listed as NOS. Anyhow, since the amp is point-to-point wired, us “curious” types might be tempted to open the bottom and do a little upgrading (please don’t do this unless you understand safety procedures). That opportunity wasn’t in the cards for me this time, but I believe upgrading at least the small signal tubes and output capacitors could yield some nice sonic improvements, for minimal effort – as it does with nearly all amps. All in all, I was very pleased with the performance of the Fluxion AV-7. If you’re in the market for a low-power triode amp with guts and finesse, I would recommend checking it out! A comparison to the Coincident would be very helpful. There is no email on the website to contact Mr. Ahn. And he says he normally sells on them eBay. I could not find any of his amps under the Fluxion label. I would be interested in this particular amp. We’re only reviewers. Pls contact Fluxion for purchase inquiries. Just want to know if you would sell custom transformers. I might want some ptx and opts. Based on this one experience only, I’m not sure this tube is in that category when it comes to the delicacy and holographic sound quality we associate with the best single ended DHT. The Russian triode rocks and sound powerful. If you’re looking for “both” qualities, in a single ended amp, they do exist, but I haven’t heard too many. For an example, look up my mini-review of the Finale 829B Special.